Processing orders have always been a time-consuming task. But using Magento 2 Bulk Order Processing module, the admin doesn’t have to visit each order page and process them individually. The admin can process the orders in bulk in just a few clicks and can save hours. The admin can create invoices, generate shipments, add tracking numbers, change order status for multiple orders all at once. The module will simplify the order processing task by Bulk Order Processing Actions. A quick way for bulk order processing in one-click. 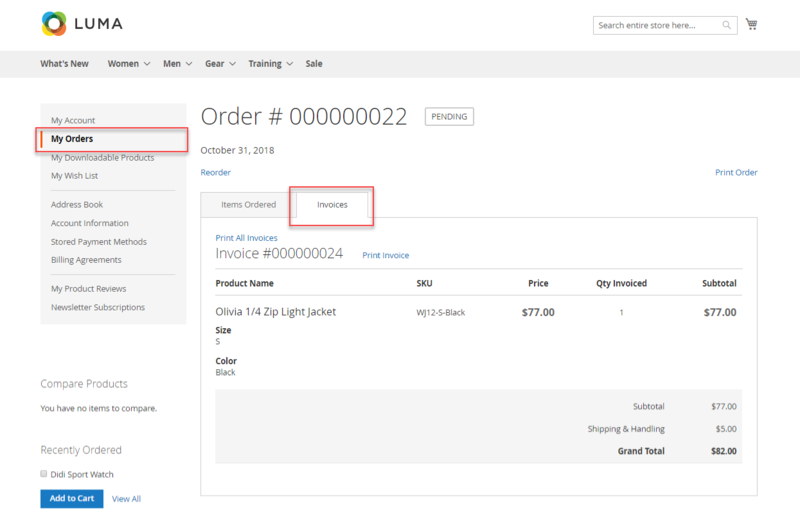 Create invoices for multiple orders. Add tracking number for every order. Generate shipments for multiple orders. After generating the shipment, the order status gets changed to “Complete” automatically. Change bulk order status to – pending/processing/complete. View detailed order information with order IDs, customer name, customer email, Bill-to, and Ship-to name. 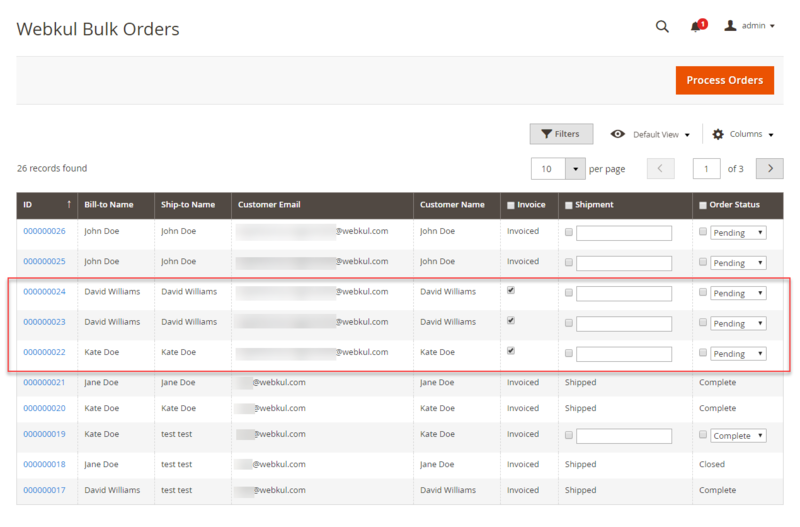 Refine orders using various filters – order ID, customer name, customer email, Bill-to, and Ship-to name. Make multiple combinations of order processing actions and execute them together. The changes will be reflected in the Magento default order list also. For module translation, navigate to the following path in your system app/code/Webkul/BulkOrder/i18n/en_US.csv. Open the file named en_US.CSV for editing as shown in the below screenshot. After the module installation, the admin can easily process the orders in bulk. For this, navigate to Bulk Orders -> Bulk Order Management as shown below. This will navigate the admin to the Bulk Order list page. Change order status to – pending/processing/complete. We will discuss each action for bulk order processing in detail. From the order list, the admin selects the orders for which the admin wants to change the order status by checking the checkbox under the column Order Status as shown below. The admin will select the status for the orders from the drop-down as per the below image. The order status can be changed to pending, processing and complete. And, finally hit the Process Orders button to process the bulk orders successfully. The changes will be reflected at the customer end also as per the below image. An invoice is a record of the receipt of payment for an order. The admin can create the invoice of the bulk orders in a just single click. From the order list, the admin selects the orders for which the admin wants to create the invoice by checking the checkbox under the column Invoice as shown below. 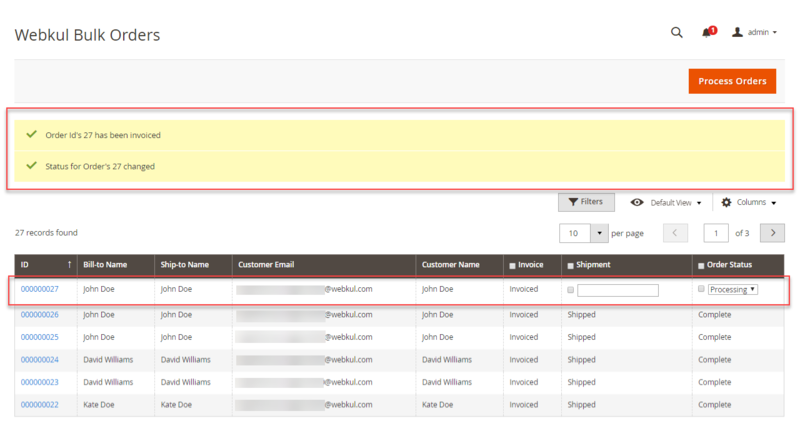 The admin can view the order invoice in the Magento default invoice list also. The respective customers will get the mail notification when admin creates the invoice for the bulk orders. And, the order invoice can be viewed at the customer end also. The admin can add the tracking number and generate shipments for bulk orders in just a single click. From the order list, the admin selects the orders for which the admin wants to generate the shipment by checking the checkbox under the column Shipment as shown below. In the text field provided, the admin will add the tracking number for the selected orders and hit the Process Orders button as shown below. After generating the shipment, the order status gets changed to Complete automatically. The admin can view the order shipment in the Magento default shipment list also. The respective customers will get the mail notification when admin generate the shipment for the bulk orders. And, the order shipment can be viewed at the customer end also. The admin can even apply multiple processing actions all at once. 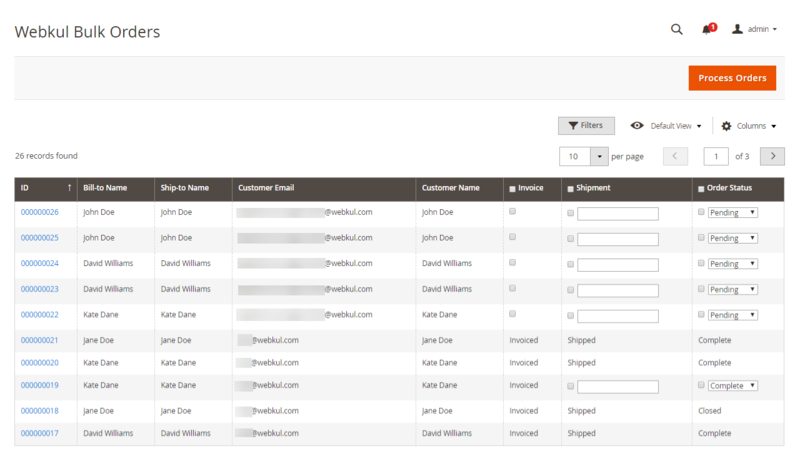 For example, the admin can create an invoice and generate shipment both in one go. Similarly, the admin can make other combinations of processing actions and execute them together. The admin can also apply multiple processing actions for bulk orders in just a single go. So, just imagine the amount of time the admin can save smoothly. 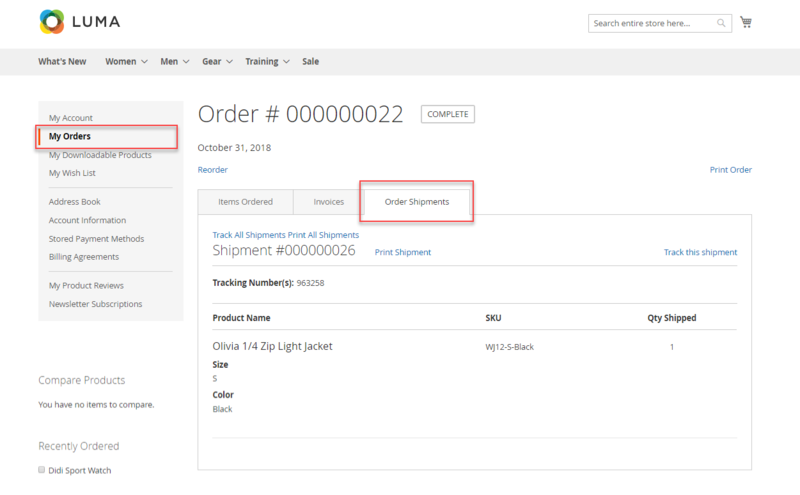 On the Bulk Order list page, the admin can view detailed order information with order IDs, customer name, customer email, Bill-to, and Ship-to name. 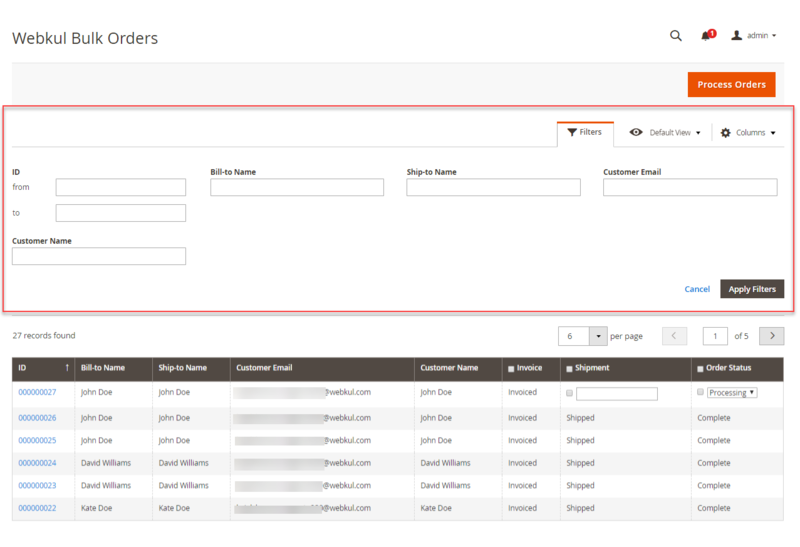 The admin can even filter orders from the list using various filters – order ID, customer name, customer email, Bill-to, and Ship-to name.